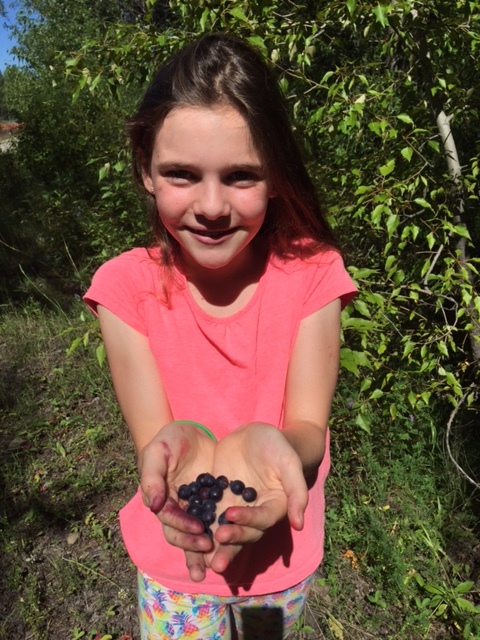 Avery holds out a handful of Saskatoon berries. She was a great help picking them. Bennett, on the other hand, spent the entire walk eating his harvest. There are so many Saskatoons on bushes right now, we walked away with about 12 cups of them. 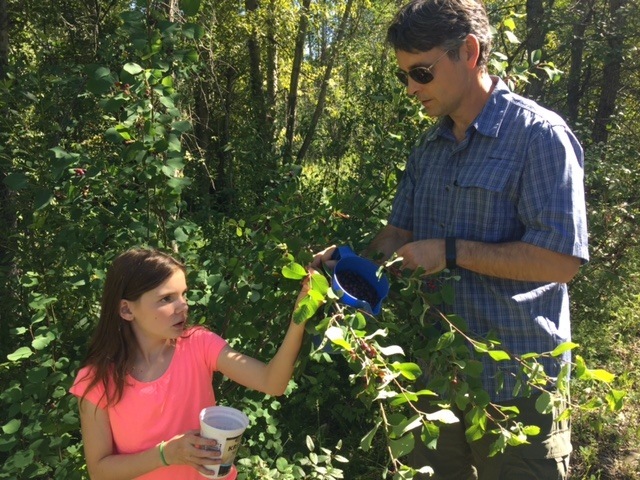 The kids love berry picking as it involves immediate gratification — they had Saskatoon stains all over their hands and faces! Our favourite spots to berry pick are along the pathway near the Fernie Stanford Resort, and over on the river trail behind the Fernie Golf Club. 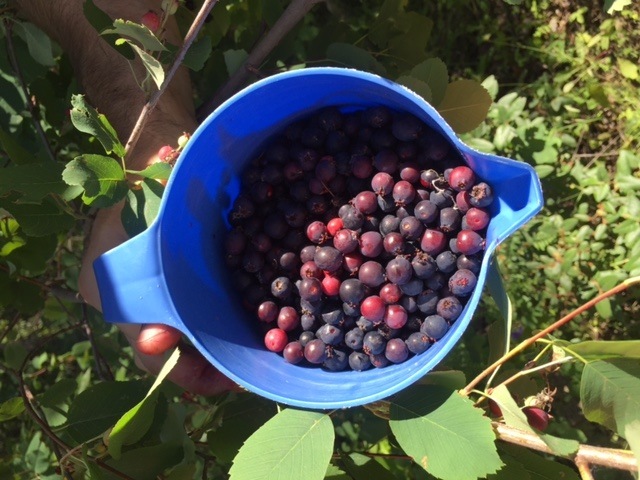 We filled up this pitcher with Saskatoon berries in no time! The fruit pickers hard at work along the river trail behind the Fernie Golf Club. What to do with so many Saskatoons? We’ve been adding them to breakfast smoothies and yogurt. Avery and Grammie also baked a Saskatoon berry pie. It turned out beautifully and was so delicious we ate it in one day! We are going to bake another one later this week with the rest of our harvest. 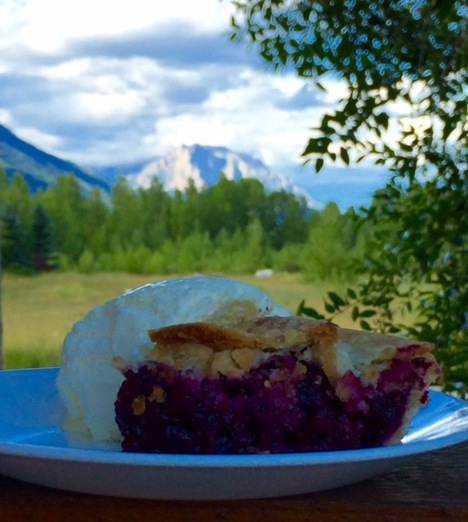 Saskatoon berry pie is a summertime treat, and a great taste of Canada! Method: Preheat oven to 425F. In a sauce pan, combine the berries, 1/2 cup sugar, water, flour and lemon juice. Bring to a boil and then simmer for 10 minutes. The berries should turn into a jam-like filling and thicken up. Pour the filling into a pie pastry and dot with the butter. You can either make your own pastry, or use a prepared frozen pastry (that’s what we did!). Place a second pie pastry on top, making sure to cut a few holes in it to let hot air escape, and then press the bottom and top crust together using a fork. Sprinkle the top with the remaining 1 tsp. sugar. Finally, put the pie in the oven and bake for 10 minutes, then turn the oven down to 350F and bake for another 35-45 minutes. Serve with vanilla ice cream and enjoy!